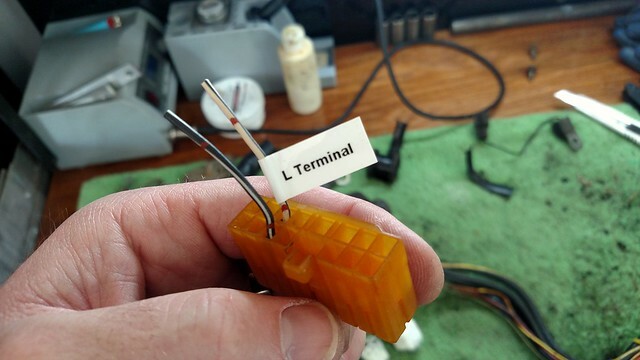 For the sense wire, you could technically run a wire from the B+ on the alternator to the pin, but the voltage at that pin is used as reference for regulating... If say, your battery is in the back, the voltage read at the battery will be less that at the B+ "output" of the alternator... This could make the alternator regulate the voltage .1 or .2 lower than it normally would in stock config, or what you would prefer. so, its good practice to have that sense wire be at least a little bit down the line from the alternator... If stock its hooked up at the fuse box, its probably best to hook it up there. I sent my decrepit harness off with a request to have these wires run within the new one. But yes, I have done that temporarily in the past. Last edited by FC Zach; 03-11-2017 at 12:18 AM..
Wasn't able to get a harness made however I did find a salvageable harness off a friend's parts car that I can make work and have done in time for DGRR. . 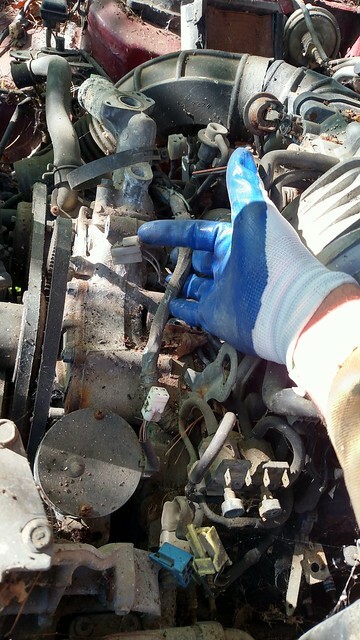 While pulling the harness off I looked for the illusive alternator connector that was thought to be on the charge harness and that I presumably had removed years ago. . That is not the case, I confirmed it's on the engine harness. Glad that mystery is solved! I've already removed tape and unnecessary wires from the salvageable harness like CAS, trans switches, and oil pan sensors. Once LMS EFI returns my old harness I'll run my alternator plug/wires before re-taping. I've been away on vacation for a week, I come home to see my package still hasn't arrived. . I sure hope it comes in within a reasonable amount of time to get the 7 drivable for the Gap! Not parts per se but my old harness I sent LMS, I will need to reuse a few things off it since Charles' spare wasn't complete. I sent Ludwig an email. . communication has been slow via email so if this falls through I'll drive the Celica again. We shall see. After redoing the harness and finally getting things corrected to make a happy alternator I found I still had a battery drain. . . 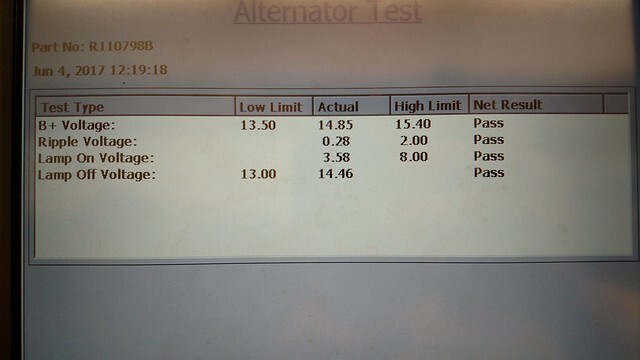 I took the alternator to get tested and it failed miserably but this was good news in a way (the search is over, I hope). Unfortunately it was just too late for my S6 alt the damage had already been done. Reason why it was a wise choice to run that one additional wire? ? No S6 alternators in stock and were special order, S4 was next day So I got an alternator arriving in the morning just in time for me to have my car ready for DGRR. Even after replacing the damaged S6, I don't think I'll be in the clear just yet. . . The "Charge" warning lamp doesn't illuminate with Key On/Engine Off and didn't illuminate while running with the damaged alternator. I'll check the bulb next. It wouldn't be DGRR week without some drama Zach. See you in a few days! Last edited by t_g_farrell; 04-25-2017 at 08:01 AM..
Ha ha, see ya then! Update. . The wires I added to support either S4 or S6 alternators do what they're supposed to. Not wanting to give up on the S6 alternator, I rebuilt it by replacing the bridge rectifier and voltage regulator this weekend. I took it to Oreilly's to have tested and it passed! Success! ! I'll be back in business without any battery drain (I hope!) and with a properly functioning alternator when I get the car running again. . . Thanks to everyone for your input and assistance with this. I tend to make a mountain out of a molehill at times but that's usually because I have no idea what I'm doing and need guidance on some topics so thanks again to everyone for the assistance with this.